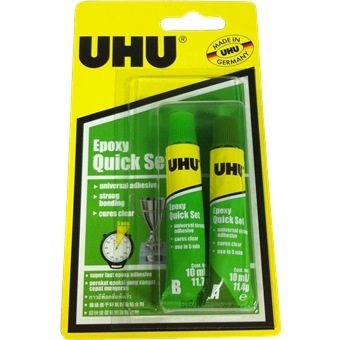 Uhu Epoxy Quick Set 2x10ml. 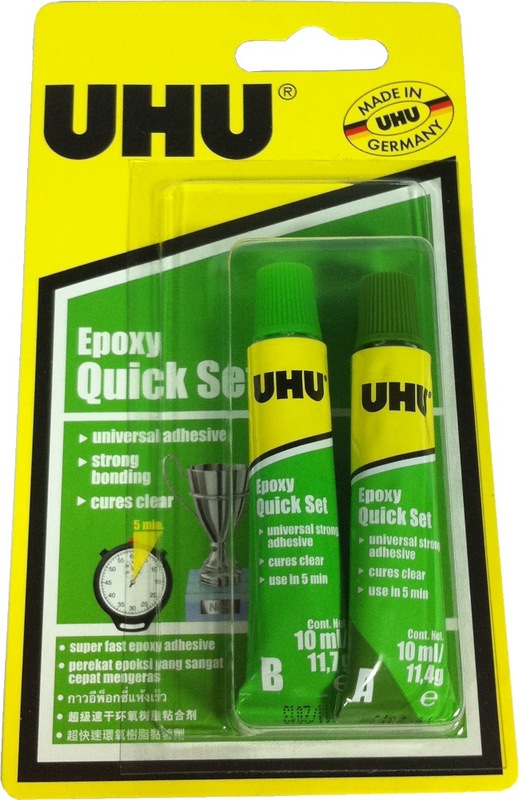 High-performance 2-component epoxy adhesive for especially fast and strong bonds. Universal adhesive , Strong bonding and Cures clear. Areas of application suitable for metal,stone,concrete,marble,wood,glass,duroplastics,styrofoam. Resistant to impact , ageing ,dampness, heat and cold. 1) Surfaces must be dry and free of grease/dust. in 1:1 ration into a mixing pan. 5)Processing time at room temperature (5min). 6)Handling strength occurs after around 20min. 7)Final bonding strength after 12 hours.